Even though it’s called Leap Day, February 29 feels like a good day to stop and look around. Here’s a fine panorama from 10 February 2015, the first day I explored the Ridgemont neighborhood high above the old Leona Quarry (1200 px). The view is almost due south. Most of the California landscape is oriented like this, northwest-to-southeast, thanks to its plate-tectonic position between the North America and Pacific plates. What are we looking at? Here’s an annotated version, with the following landmarks noted. 1: Mission Peak, overlooking Fremont and San Jose. 2: Knowland Park hill with its green meadows. 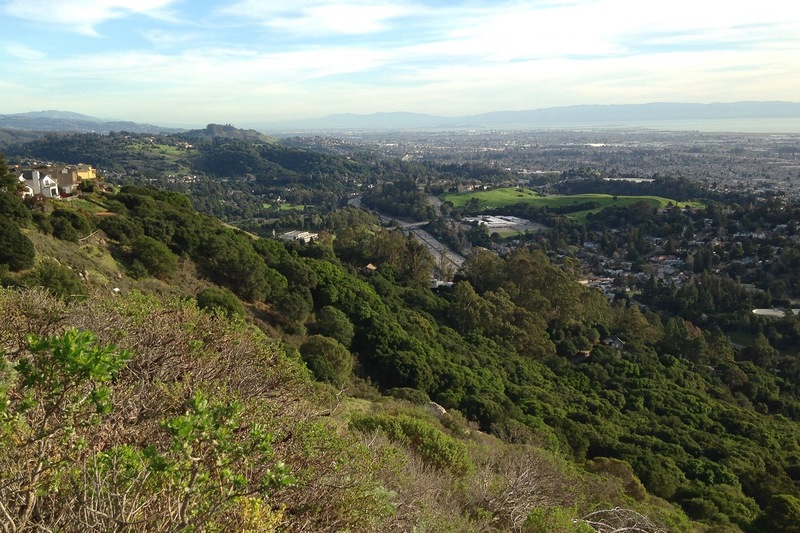 3: Fairmont Ridge, overlooking San Leandro. 5: Mount Umunhum and the spine of the Sierra Azul. 6: Coyote Hills on this side of the bay, Stevens Creek canyon on the other, where route 17 leads to Santa Cruz. 7: King Estates Open Space, looking its emerald best. 8: Black Mountain overlooking Mountain View (and hey what a coincidence). All of these are great places to visit. 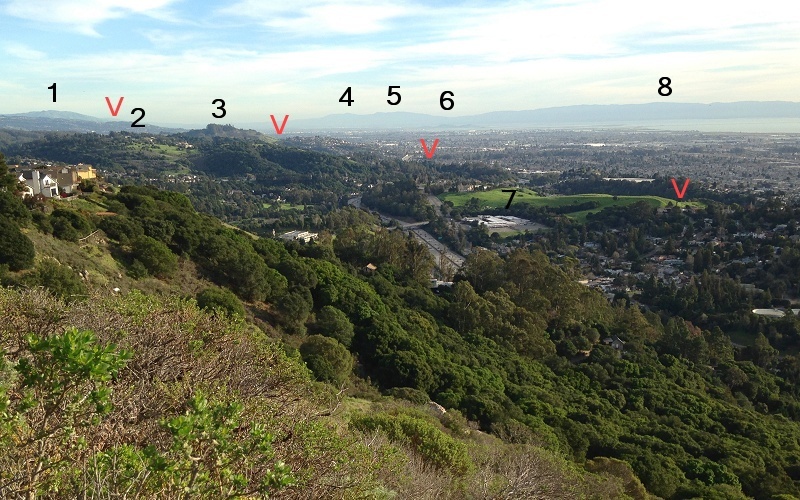 The red Vs mark the Hayward fault, left to right: at the foot of Mission Peak, in the saddle of Fairmont Ridge, in the Oakland Zoo and running down the valley of Arroyo Viejo past Holy Redeemer College. This entry was posted on 29 February 2016 at 8:03 am and is filed under Oakland geology views, The Hayward fault. You can follow any responses to this entry through the RSS 2.0 feed. You can skip to the end and leave a response. Pinging is currently not allowed.